2. A sharp end or apex. 5. To become ready to open, said of an abscess or boil, the wall of which is becoming thin and about to rupture. 6. In mathematics, a dimensionless geometric element. 7. A location or position on a graph, plot, or diagram. point B a radiographic cephalometric landmark, determined on the lateral head film; it is the most posterior midline point in the concavity between the infradentale and pogonium. boiling point the temperature at which a liquid will boil; at sea level, water boils at 100°C (212°F). 2. four points within the pelvic inlet—the two sacroiliac articulations and the two iliopectineal eminences. craniometric point one of the established points of reference for measurement of the skull. far point the remotest point at which an object is clearly seen when the eye is at rest. 1. the point on which the vision is fixed. 2. the point on the retina on which are focused the rays coming from an object directly regarded. freezing point the temperature at which a liquid begins to freeze; for water, 0°C, or 32°F. isoelectric point the pH of a solution at which a charged molecule does not migrate in an electric field. jugal point the point at the angle formed by the masseteric and maxillary edges of the zygomatic bone. lacrimal point the opening on the lacrimal papilla of an eyelid, near the medial angle of the eye, into which tears from the lacrimal lake drain to enter the lacrimal canaliculi. 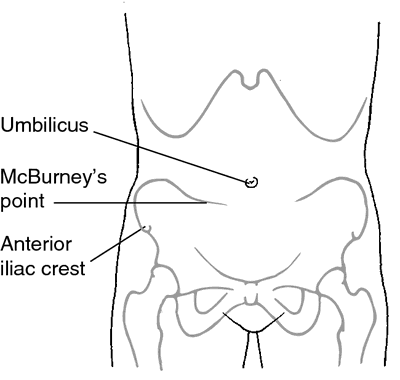 McBurney point a point of special tenderness in appendicitis, about one-third the distance between the right anterior superior iliac spine and the umbilicus. point of maximal impulse the point on the chest where the impulse of the left ventricle is felt most strongly, normally in the fifth costal interspace inside the mammillary line. Abbreviated PMI. melting point (mp) the minimum temperature at which a solid begins to liquefy. near point the nearest point of clear vision, the absolute near p. being that for either eye alone with accommodation relaxed, and the relative near p. that for both eyes with the employment of accommodation. nodal points two points on the axis of an optical system situated so that a ray falling on one will produce a parallel ray emerging through the other. 1. a point that is particularly sensitive to pressure. 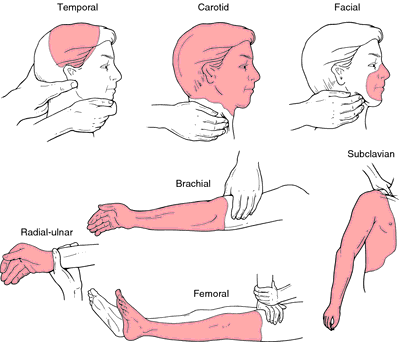 Various pressure points used to control hemorrhage. subnasal point the central point at the base of the nasal spine. 1. A sharp or tapered end. 2. A place or locality considered with regard to its position. 3. A stage or condition reached. 1. To direct or aim something. 2. To direct attention with or as if with the finger. 3. To become ready to open, as an abscess or boil. a small spot or designated area. Vox populi A small place. See Alarm point, Blockade point, Breakpoint point, Cell cycle restriction point, Checkpoint point, Critical control point, Dilution end point, Distal point, Dose point, Eye reference point, Fixed point, Flashpoint, Isobetic point, Joint point, Limit point, Loo point, Matrix point, McBurney's point, Murphy's point, Myofascial trigger point, Pressure point, Reorder point, Saddle point, Saddle node point, Satellite point, Shu point, Trigger point. 4. A stage or condition reached, such as the boiling point. 5. To become ready to open, referring to an abscess or boil, the wall of which is becoming thin and is about to break. n 1. in acupuncture, a place where the channels run near the surface of the body. These points are stimulated by acupuncture theory and experience. 2. a location defined by a set of coordinates along a line. n the temperature at which liquid changes to a gas at atmospheric pressure; the temperature at which a liquid boils. n 1. a point on the body away from the center. 2. a referred or nearby area of pain, (as opposed to the primary, or most painful area) that acupressurists apply deep pressure to in order to release the tension. n in acupuncture, a point that does not fall on a channel. n the lowest temperature at which the vapor of a liquid is flammable. Typical flash point values for essential oils are between 33 °C and 77° C.
n the site on a gas-liquid chromatograph in which small amount of sample material being analyzed is introduced. See also gas-liquid chromatography. n in acupressure, the area of acute pain. n the temperature at which a substance under normal atmospheric pressure changes from a solid phase to a liquid phase. n the muscle entry point for the motor nerve which innervates it. n area of an acupuncture meridian that induces sedation when stimulated by the insertion of a fine needle. n a place in which minute variation in one specification causes enormous change in another. n area of an acupuncture meridian that activates the entire meridian. n in craniosacral therapy, a short interruption in the rhythm created through fluctuation of the cerebrospinal fluid, achieved when tension of membranes or ligaments has been balanced. See also therapy, craniosacral. n area in an acupuncture meridian that stimulates the meridian when a filiform needle is inserted into it. n hypersensitive spot on the body that responds to stimulation by reflexively producing pain or an other manifestation. n one of a family of acupuncture points that are stimulated when energy stimulation is needed. oh yes! points. See also points, trigger. n.pl key points used in traditional acupuncture that are located along the toes and fingers and are considered the terminal points of the body's meridians. Any marked sensitivity in these points indicates a presence of energy imbalance and dysfunction. n.pl See neurovascular (NV) reflex points. 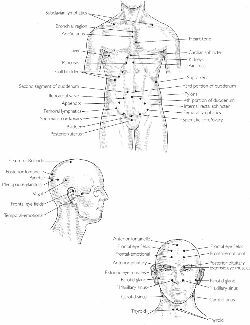 n.pl points generally positioned away from the center of the body that a practitioner can palpate to identify tension, tautness, vacancy, tenderness, or nonresilience and diagnose bodily dysfunctions. n.pl special acupoints that lie on the extremities, specifically between the fingers and elbows and the toes and knees that are known for their influence over the whole body and the flow of qi. See also acupoints, acupressure, acupuncture, and qi. n.pl acupoints on each meridian believed to be parti-cularly efficacious in manipulating energy. See also acupoints, acupressure, acupuncture, meridians, and qi. n.pl acupuncture sites on the body that are so sensitive to pain that needle insertion is impossible. n.pl small, inconspicuous areas located throughout the body, which serve as sensory indications of a somatic disturbance or dysfunction. The system of evaluation that uses these regions as reference guides was discovered and developed by Lawrence Jones, DO. Dr. Jones also developed the strain/counterstrain or SCS approach as a method of correcting these dysfunctions. See also SCS. n.pl acupuncture points on the body that are healthy and do not present any indications of point pathology. n.pl areas of tenderness and spasm within tight bands of skeletal muscle. n.pl numerous points situated all over the anterior side of the body that are used by a practitioner to indicate a specific diagnosis, impact functions of specific muscles, or relieve symptoms. 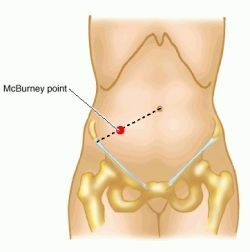 The practitioner locates these points while performing neuromuscular techniques on the abdomen. If active, these regions will have an increased sensitivity to light pressure. n.pl points that exhibit tenderness upon application of mechanical stimulation techniques like palpation. n.pl four acupuncture points, grouped on the most superior aspect of the scalp; useful for tranquilizing the mind and regulating the central nervous system to encourage sleep. n.pl hypersen-sitive points in the muscles and fascia. n.pl tender areas localized to a specific region of the body that is able to transmit sensations of pain into a ‘target’ tissue. Pressure can also bring about painful sensations. These areas can be located in any soft tissues, particularly fascia and/or muscle, and are described as either ‘active’ or ‘latent.’ Palpation may be necessary to locate individual areas of tenderness. A small spot, considered only as to its position. aplanatic point's See aplanatic focus. 1. The point at which the fixation target appears blurred on the introduction of increasing prisms and/or lens power, as for example in a test for relative convergence. 2. A point on a graph representing the limit of clear, single, binocular vision. See relative convergence; binocular vision single zone of clear. break point The point at which diplopia occurs when increasing prism or lens power during binocular fixation. See blur point; relative convergence. cardinal point's Six points on the optical axis of a lens system or thick lens: the two principal foci, the two principal points and the two nodal points. (Sometimes, this definition also includes the axial object and image points.) (Fig. P14) Syn. gaussian points (some authors consider this term synonymous, although it does not include the two nodal points). See cardinal planes. centration point The point at which the optical centre (of a lens) is to be located in the absence of a prescribed prism, or after any prescribed prism has been neutralized. If the centration point is not specified, it is located at the standard optical centre position (British Standard). See standard optical position centre; decentration. conjugate point's See conjugate distances. point of convergence 1. The point of intersection of the lines of sight. 2. The point to which rays of light converge. corresponding retinal point's See retinal corresponding points. distance visual point (DVD) An assumed position of the visual point on a lens used for distance vision under given conditions, normally when the eyes are in the primary position. .equivalent point's See nodal points. far point of accommodation See far point of accommodation. far point of convergence See convergence, far point of. point of fixation See point of fixation. focal point See principal focus. gaussian p's . The two principal points and the two focal points on the optical axis of a lens system. See cardinal points. image p . The point at which an object point is formed by an optical system. of incidence The point at which a ray of light intersects a refracting or reflecting surface. lacrimal point See lacrimal punctum. near point of accommodation See near point of accommodation. near point of convergence See near point of convergence. near visual point (NVP) An assumed position of the visual point on a lens used for near vision under given conditions. See visual point. neutral point 1. In retinoscopy, it is the point at which the sight hole of the retinoscope is conjugate with the patient's retina. At this point, no reflex motion can be seen by the examiner and the entire pupil is illuminated completely, or is completely dark. This is obtained in a myopic eye when the retinoscope is placed at the far point of accommodation. When testing emmetropes and hyperopes this neutral point is reached when sufficient converging lens power has been added in order to displace the far point (artificially) to the sight hole of the retinoscope. See conjugate distances. 2. In dichromats, it is a region of the spectrum that appears colourless. See deuteranopia; protanopia; tritanopia. nodal point's In a centred optical system they are a pair of conjugate points on the axis which have the property that any incident ray which passes through the first nodal point leaves the system as though from the second nodal point and parallel to the incident ray. Thus the refracted ray is unchanged in direction, although displaced. The distance between the two nodal points is equal to the distance between the two principal points. When the refractive indices on each side of the system are equal, as in the case of a thick lens in air, the principal and nodal points coincide. They are then called equivalent points. In a single refracting surface, the nodal points coincide with the centre of curvature, while the principal points coincide with the vertex of the surface (Figs. P12 and P14). See optical centre; principal plane; vertex. null p . See nystagmus. point object See point object. principal point's The points of intersection of the principal planes with the optical axis. The principal points are the usual reference points from which the focal lengths and the object and image distances are measured (Figs. P12 and P14). See equivalent power. recovery point The point at which fusion is regained on decreasing the prism or lens power which originally induced diplopia in investigation of relative accommodation and convergence. See relative convergence. point of regard Usually a synonym of point of fixation. However, in some circumstances it may be a peripheral point in space upon which visual attention is directed, while the eye is looking foveally at a point of fixation. See point of fixation. point source See point source. visual point The point of intersection of the visual axis with the back surface of a spectacle lens (British Standard). See distance visual point; near visual point. point zero A point on the retina of a strabismic eye which has acquired the same visual direction, under binocular conditions, as the fovea of the fixating eye. 2. Sharp end or apex. 4. To become ready to open, said of an abscess or boil, the wall of which is thin and about to rupture. n 1. a small spot or a small area. n 2. a rotating instrument having a small cutting end or surface. n the deepest point in the bony concavity in the midline at the base of the anterior nasal spine, in the region of the incisor roots. A landmark on the lateral cephalometric view. n a mandibular point comparable to point A.
n the highest point of the curvature between the occipital condyle and the basilar part of the occipital bone and located behind the occipital condyle. A substitute for the basion point when it cannot be ascertained on cephalometric headplates. n the contact point of a central-bearing device. See also central-bearing device. n the nib of a condensing instrument, which is a short instrument for condensing foil or amalgam that is inserted into a mechanical condenser or into a cone socket handle. contact area. See also open contact. n a small undercut in the cavity wall convenient for placing and retaining the first portion of a filling material. It is generally one of the retention points placed in a cavity preparation that provides the best access to the operator. n the center of the body of the symphysis. n a defective contact between the proximal surfaces of adjacent teeth, produced by wearing of the contact areas, dental caries, improper restoration, or altered tooth position. See also open contact. n a point placed on the skin corresponding with the opening axis of the mandible. n.pr a calibrated silver rod used to record the clinical depth of periodontal pockets radiographically for the purpose of diagnosis. n the intersection of the mandibular occlusal and midsagittal planes. The point at the mesioincisal angles of the two mandibular central incisors. n the failure of contact of convex proximal surfaces of adjacent teeth; produced by tooth migration, dental caries, or improper restoration. n a point on the anteroposterior center of the mandibular ridge in the median sagittal plane. n if the point of the buccal cusp of the mandibular right molar, put in lateral position, arcs around the upright axis of the right condyle, it will reach a station where further muscular efforts leftward will change the cusp's direction so that it will arc around the left condyle. The station where the right arc ends and the left arc begins is a point of mandibular centricity. While the right cusp point orbits (arcs) around the near vertical axis, all other points in the jaw join in orbiting (arcing). The left condyle arcs rearward until it reaches a cranial backstop; then the muscles start rotating it and carrying it leftward, and the right condyle begins arcing forward, downward, and medially. In the right and left swings of the jaw, a condyle reciprocally alternates between being a rotator and an orbiter. The point of centricity of the mandible is demonstrated usually on a horizontal plane, but it can be demonstrated on all three planes of projection. The point of centricity is rearmost, midmost (between the arcs of motion), and uppermost. See also face-bow and relation, centric. n a point considered as fixed for a particular pattern of analysis. Also, the midpoint of a perpendicular line from the sella turcica to the Bolton-nasion plane. n a piece of paper point, selected for the root canal being treated, that carries or holds the medication in place. n a cone of filling material placed in a canal and radiographed to check on the length and fit of the filling. n the point from which referred pain initiates. In the myofascial pain syndrome, usually a localized, deep tenderness in a taut bundle of muscle fibers from which pain is referred to other sites. n 1. the place on the stress-strain curve where marked permanent deformation occurs. It is just beyond the proportional limit. n 2. the point where permanent deformation starts in a metal.